Don't get so excited with eBay prices that you pay more than the price of a new tool! The current MSRP of the Shopsmith Speed Reducer is $278.31. The MSRP of the Speed Increaser is $280.88. These two tools went extinct for a couple years and the used prices went through the roof! FYI, You can use the Shopsmith Speed reducer on the Mark I (For Disc Sanding and Lathe Turning only), and on the Mark II, Mark V, Mark VII for Sanding, Turning and Drilling! The Speed Increaser can be used for Shaping and Routing on the Mark I, Mark V Model 500, 505, 510, and 520. The Shopsmith Speed increaser was inspired in part by a Lawnboy lawnmower. T he Shopsmith Speed increaser contains two common parts that you wouldn't suspect: A 3 3/4" faceplate (Yes, a faceplate that you'd use for turning) and a water pump bearing assembly like the one found on the Mark V, the Shopsmith Bandsaw and several Shopsmith tools. There is a thin plastic disc on the above mentioned faceplate that must be occasionally replaced. It's life can be extended if you make sure to turn the speed down before you turn your Mark V off (It doesn't need to go all the way down to slow though) and make sure that it's running at full speed before your plunge the wood into the cutter. Even though it will raise the speed to 10,000rpm's, keep in mind that this is still half the proper speed for a router bit. 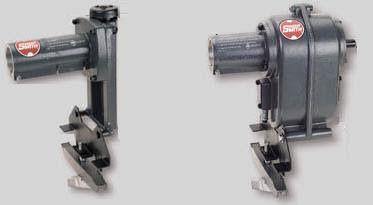 That said this is just right for shaper cutters because they have three cutters as apposed to two, and they are usually a larger diameter than router bits. This makes their tip speed much faster than a smaller dia. router bit. The Shopsmith Speed Reducer is an amazing device that contains two Poly-V belts, four pulleys and five bearing assemblies! You can't make out much from the one patent drawing that I've included, but the patent even covers several other possible designs that could have used chains and sprockets or engaged gears. Most people don't know that the Shopsmith Speed Reducer can be used to drive the Shopsmith Bandsaw at slow speeds for sawing plastic and metal? Watch this video to see how.